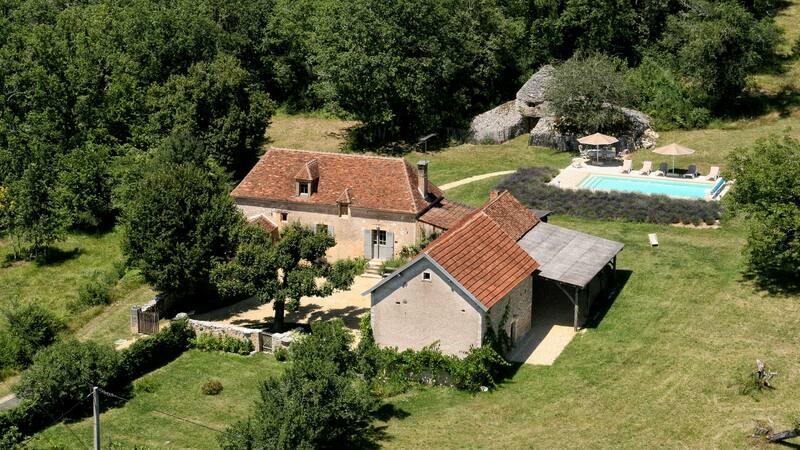 The "Ferme d'Araucanie" is classified 5 Stars (*****) by prefectoral decree dated January 29, 2010. An old farm, completely privative, with modern conveniences (air-conditionning in the two bedromms under the roof, internet access, WiFi, LCD television, DVD, top of the range kitchen appliances ...) mixed with the charm of an authentic restoration. In a world where we tend to forget the real vlaues, special attention has been paid to the use of genuine materials such as walls made out of a mixture of sand and chalk, stone tiles, chestnut and poplar wood, and restoration of the roof by using old recovered tiles. The house offers a library with an important collection of regional literature. On the ground floor a living room of 4 m2 with an open fire and a dining room with an open kitchen fitted with top of the range kitchen appliances. a private heated pool (10m x 5m) with salt water, behing the house and an astonishing stone hut (Borie), a masterpiece of the old rural architecture of the Perigord and a herb garden with aromatic plants (thyme, laurel, savory, salvia, mint, coriander, basil, chives, parsley, sorrel ...).